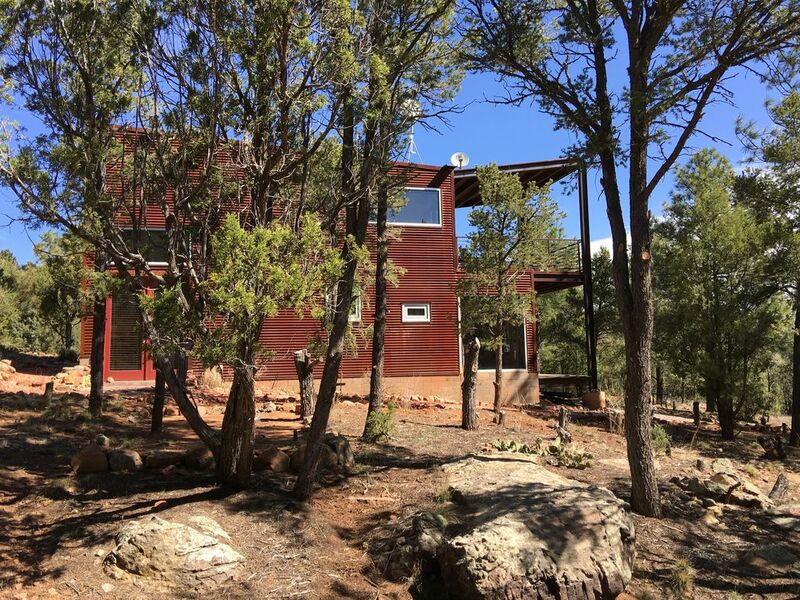 Located 35 minutes East of Downtown Santa Fe off I-25, this beautiful Modern style Cabin/Guest house is nestled on 6 private wooded acres. It offers Natural beauty and tranquility amongst Ponderosa Pines and Pinon's, with views of the Pecos Valley and Glorieta Mesa. It is a 900 sq foot 2 levels Cabin/Guesthouse. With full equipped kitchen and dinning area that open up to a small deck with BBQ grill, full bathroom with bathtub, stackable washer and dryer and open bedroom with queen size bed and french doors leading into the woods. The Upstairs loft can be used as an office space , relaxing area with gorgeous views or as an extra sleeping space for kids using sofa sleeper or a little sectional sofa ,that can also be used as a bed for a child .The french doors open to a spacious deck,where you can enjoy your morning coffee or just relax. For families with babies or small children we can provide a foldable play pen/crib. Wi-Fi Internet and cable TV included. Bring your family to this amazing location, wonderful for any traveler who likes to be close to nature. Glorieta is the passageway to the Pecos Wilderness, The Pecos National Historical Park and the Pecos River, where you can enjoy fly fishing, horseback riding ,amazing hiking and mountain biking trails. It is very convenient to Santa Fe ,so it offers guests the best of both worlds .This location is perfect for both nature and city lovers alike.Near by you will find an incredible dinning experience at Cafe Fina. For the winter sports enthusiasts it is within an hour and 15min to two hours drive to 6 different ski areas: Santa fe Ski Area, Sipapu , Pajarito Mountain,Sandia Snow peak Angel Fire Ski resort and the World famous Taos Ski Resort. For an extra fee we can offer pre arrival grocery shopping and you can also schedule an on site massage with our certified massage therapist. Nature is our playground!!! My husband and I come from opposite parts of the world (he’s from Guatemala , I’m from Czech Republic) We consider ourselves blessed to have found this amazing place here in Glorieta N.M, that we can call home. We are fortunate to have the opportunity of raising our children with Love and Respect for Mother Nature. Propane heater and electric stove heater. Refrigerator/Freezer combination with ice maker. Small deck out of the kitchen. Large deck with beautiful views in the Loft area. Closest Ski facility is about an hour away :Ski Santa Fe. Perfect place to stay while visiting the Santa Fe area, Snowboarding and enjoying Shopping and eating in Santa Fe and surrounding area. Secluded with awesome scenery. Everything we needed while we were there. Everything was clean and ready for us! It was a perfect setting for two to get away and still have access to Santa Fe. We loved our stay at the Cabin in the Woods! It is a cozy, functional house in a beautiful setting convenient. This cabin is a modern get away. It was clean and had gorgeous views out of every window! It was cozy without being claustrophobic. Very quiet and serene location. It was pretty cold and snowy when we visited so we didn't get to hike the trails around the cabin. The owners answered questions quickly and everything was just as advertised. I was a little leery because of the one review that mentioned the bed was bad. I found that the bed was not bad. It was very comfortable, it just seems to have very noisy box springs. If you can ignore that, then you will have a WONDERFUL time in this little cabin in the woods! We spent a week at this lovely cabin in the forest. It was very private, and peaceful, and was stocked with everything we needed. We really enjoyed out stay at this cabin. This was the perfect location for us between trips to Santa Fe and trout fishing in Pecos Canyon. Sunsets and Sunrises were spectacular from the covered balcony.